From 3D films to 3D prints, three-dimensional representations are looking to portray objects or images as close as possible to reality – at least from human perspective. Dr Mathias Disney (University College London) and collaborators are doing just this with forests around the world. 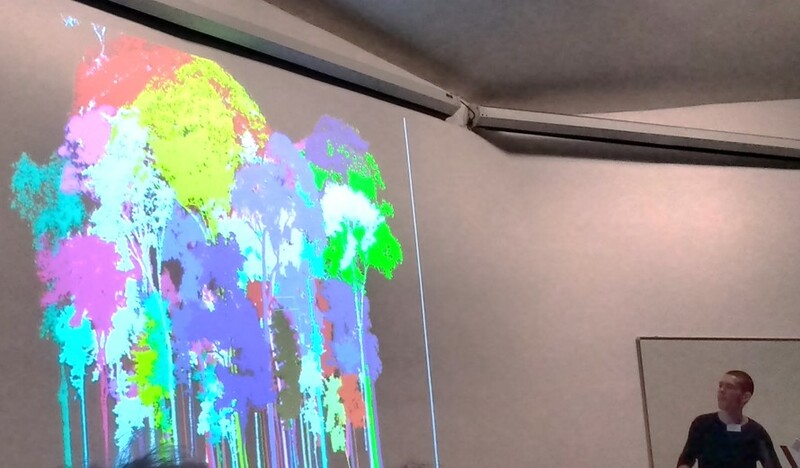 In the symposium Space – the final frontier for biodiversity monitoring?, hosted by the Zoological Society of London (29 April 2016), Dr Disney presented how innovative 3D measurements and models can improve our knowledge about the structure and function of continuously changing forests. This approach has the potential to exploit satellite observations and remote sensing data in new ways providing important insights. In the words of Dr Disney, “what remote sensing does is to count photons at the top of the atmosphere”. However, what truly matters to us is the physical correlation among these photons and the monitored environment. Understanding this correlation is the true challenge as to get the information that we are interested in – say the occurrence of forest or farmland – often involves combining empirical data, theoretical assumptions, and the creation of models. It is in this stage where misunderstanding, misestimation and disagreement take place. Disney exemplifies this issue with forests biomass; studies based on limited empirical data about forest properties have led to very contrasting results. Thus, there is the need to develop new methods and techniques to improve our knowledge. One of the limitations of satellite remote sensing (SRS) images is that these provide information derived from above – hence data related to the top-most layer. In the case of forests, this is relates to the canopy. However, no information about terrain or tree structure at the understory level is given, leading to under- or overestimation of forest biomass for instance. In contrast, with SRS, ground-based field measurements are more accurate. Rather obviously, measuring the biomass of the planet’s >3 trillion trees is an impossible task. Accuracy and extension are attributes difficult to reconcile. Reversing what is often seen as a problem, Disney considers it an opportunity to explore in detail the links between ground-based measurements and remote sensing data. The questions he prompts are how much do ground-based measurements differ from those measured from satellites and why? By answering this, there is the potential to use local scale ground-based data in conjunction with global scale satellite data. The approach proposed by Disney combines 3D modelling and the principle of allometry – biological relationship between size and shape. First, a terrestrial laser scanner placed in a given forest is used to sample millions of points from tree structure. Then continues the much more complex process of modelling to connect the points. Attributes like volume, height, branch distribution of the trees can be obtained, allowing for estimation of biomass and other relevant properties for conservancy and forestry. Terrestrial laser scanning (TLS) made in Lope National Park, Gabon (watch video below) exemplifies this technique. Validation of such models requires cutting down just a few trees to compare the values obtained against direct empirical measurements. The technique provides extremely detailed biome-specific data of forests structure with clear benefits to conservation and management practitioners. From an SRS perspective, the method can be used to validate current information derived from satellite images, such as leaf area index or albedo. Most importantly to Disney however, the technique allows the construction of a generic model that helps to interpret satellite data. This can then be used to find the relationship between satellite and ground-based data in order to understand why satellite data provides differing estimates from what we see on the ground. The bad news is that the technology required for these kind of studies are prohibitively expensive, though Disney is confident that along with technological innovations, the technology will become affordable and accessible in the near future, together with the resulting data. For the last three decades, satellite images have provide valuable and continuous records of the earth’s surface, including changes in land use, deforestation and reforestation processes. Now, the 3D-models have the potential to complement satellite imagery, to provide essential information on how these changes affect ecosystems structure and functioning. Ecosystems functioning is an aspect of particular importance from the ecosystem services (ES) perspective. This approach has the potential of spatially scaling up studies on ES provisioning accompanied by detailed information at local scale. This is highly beneficial to research like mine– focused on assess how the change from forest to cropland affects the supply of ecosystem services provided by animals in the tropics. Certainly, valuable information can be obtained from the space. However, as Dr Emma Tebbs (King’s College London) stated during this symposium, “we cannot do everything from space…There is a need to carry out systematic ground based measurements, and produce data sets that can be combined with satellite imaginary”. One of the main messages conveyed by the symposium was the relevance of an integrated approach to get the most from the available information derived from space, air, ground or water. The presentations provided by Dr Disney, Dr Tebbs and the many other speakers serve to highlight the importance of developing methods, techniques and tools to improve our understanding of environmental properties and processes, the founding aims of the Earth Observation and Environmental Sensing activity hub. Disney, M. (2016) ‘New ways of looking at old forests: detecting ecosystem change using 3D measurements and models.’ Unpublished presentation at: Space – the final frontier for biodiversity monitoring? Symposium, 29 April 2016, ZSL Meeting Rooms, London. Tebbs, E. (2016) ‘Mapping and monitoring High Nature Value farmland in the UK using satellite data.’ Unpublished presentation at: Space – the final frontier for biodiversity monitoring? Symposium, 29 April 2016, ZSL Meeting Rooms, London. This entry was posted in Conference reports, Earth Observation and tagged 3D Models, Remote sensing by Molly McCullough. Bookmark the permalink.